Miss Eleanor Brown travelled here on a boat that was bringing reinforcements for the Zulu war and the officers cheered her as she left the ship – a lone woman travelling to the unknown interior. She came to Riebeek as a teacher and was a most efficient woman with a strong personality. She was the niece of Dr Haig Brown, Headmaster of the well-known school, Charterhouse. Miss Brown’s education had been acquired before the days of women’s colleges, but she had received a thorough training in England. She was most successful in teaching English Literature. She was an enthusiastic Londoner, and the great city lived for her pupils in the vivid descriptions she gave of its places of historical interest. It was Miss Brown who imported the silver bee that principals wear on special occasions. She intended the bee to be worn by all pupils as a school badge with the motto Ora et Labora but this proved to be too expensive. Miss Brown gave the bee to Miss Brehm, who gave it to Miss Loggenburg. She then presented it to Miss Bartlett and so the tradition was born of the bee being handed to each principal. It was under Miss Brown’s leadership that Riebeek became a senior and junior school. Riebeek had a music department, an art department, needlework classes, tennis courts, a croquet lawn was laid down, a science lab with the latest equipment . Girls could start taking part in debates and there was the establishing of societies. Miss Brown was at the helm of the school at a difficult time. She had the qualities of a pioneer and she was prepared to meet the discomforts of an undeveloped land. She displayed tenacity, a strong personality and strict discipline. 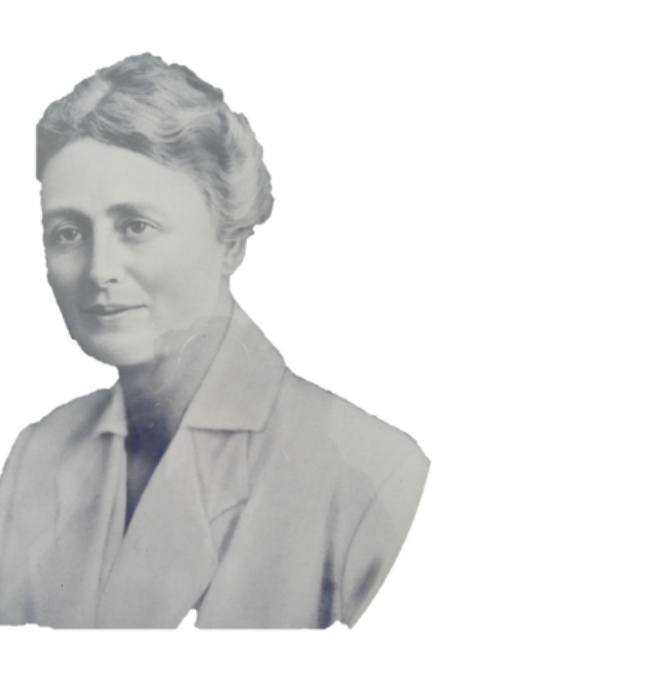 By 1896 Miss Brown had much to contend with – increasing number of pupils, no space, no proper classroom facilities, teachers highly qualified with strong personalities and there was irritation and frustration. It was clear that Miss Brown had a passionate temper and the courage of her convictions. She found release by leaving her office and the school and not returning until she had simmered down. Often she would be away during the first week of school and letters from parents appeared in the local newspapers. When admonished by the committee, she showed herself to be a law unto herself and dismissed the whole incident with a curt reply and a flick of her fingers and the pursing of her lips. At times she would resign and then withdraw the resignation. She had an indomitable character and though her health was not good she worked vigorously and robustly wearing down her own resources. She took leave frequently and her visits to England would extend from 3 months to 6 months. Though she was a disciplinarian she did have compassion and a loving spirit. It has been hinted that she had experienced a great personal tragedy, perhaps jilted in love. During her reign the hours of attendance became fixed. School started at 8:30 in summer and at 9 in winter. School days were five hours long and the girls had a half hour break. In 1900 she felt she could not go on. After a serious illness she applied to be allowed to resign two years before her time of retirement. She never forgot Riebeek. In England, she kept an open house for teacher and pupils. Miss Lucy Charlotte Elton was a distinguished, intellectual lady who was a strict disciplinarian – some called her straight-laced. She was dignified, respected and emitted an aura of awe. She was always beautifully turned out – immaculately so! Her iron grey hair and her iron grey spectacles enhanced her personality. She was an excellent teacher of English and imbued her girls with a love of good literature. 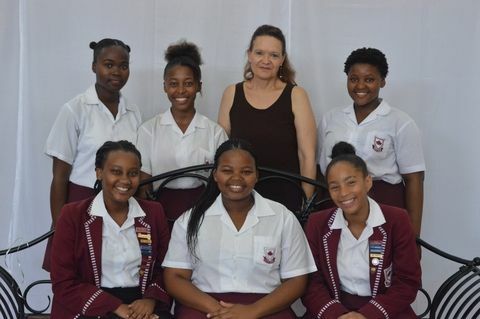 When she left Riebeek, the school library had 1 000 volumes. She had a quick sense of humour. Before leaving, she had to deal with children who removed the ivory covers from the keys of the pianos. During a week’s leave, Miss Elton visited Cape Town and accepted the post of principal of the Good Hope Seminary from January 1916. She had given direction to the curriculum and brought stability. Great emphasis was placed on the classics and English Literature. The House system has its origin in Britain and its colonies in about 1850 with boarding schools residences designated as houses for purposes of internal competition. This was intended to sharpen sporting skills, improve behaviour and instill a sense of belonging and esprit-de-corps. Gradually the house system spread to day schools. 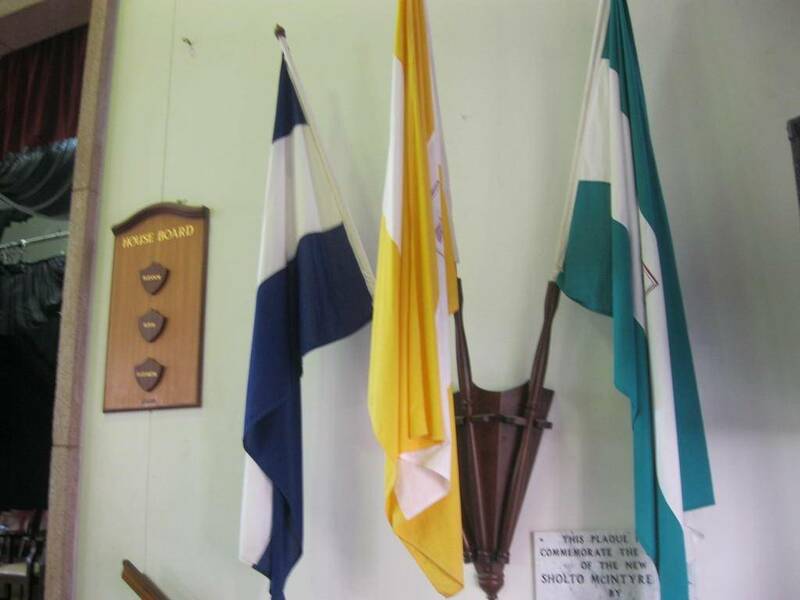 Riebeek's house system was starting 47 years after the School was founded. In 1924 the school's pupils were formally divided into two houses for the purposes of a sports competition. One house was named Eleanor, after Miss Eleanor Brown, a past headmistress in the late 1800s. The other house was named Elton, after Miss Lucy Elton, headmistress in the early 1900s. Note that one house was given a first name and the other house was given a surname. It was decided in 1953 to add another house to the expanding school. Headgirl of 1953, Gillian Killeen nee Dugmore went for a farewell interview with Mrs J.A.D. Miller, the Headmistress of the time. Gillian was asked if there were any improvements she could suggest and Gillian replied that every time they had sports competitions the school was split into two hostile camps and that even friendships suffered. Perhaps the introduction of a third house would defuse the situation. Gillian suggested that another "E" name would be appropriate. The new house was called Elizabeth after the lady of the same name who had shortly before been crowned "Elizabeth the Second, by the Grace of God, of the United Kingdom of Great Britian and Northern Ireland of her others realms and terroritories queen, head of the Commonwealth, Defender of the Faith. The new house came into being in 1954 and the colour of blue was selected because of the blue sash that Queen Elizabeth wears to depict royalty. interestingly enough, starting with the letter El The colour of the new house was blue, because of the blue sash that Queen Elizabeth wears, depicting royalty. Incidentally, for those with a penchant for trivia, international tennis star Linky Boshoff, arguably Riebeek’s most famous learner, was in Elizabeth. During my 29 years as a teacher at Riebeek, I saw little change in the house system, but some patterns had emerged. For instance, Elton became known for its swimming prowess, while, of late, Eleanor has shown strength academically. Elizabeth went through a bad patch at one stage, so much so that people began to wonder whether there was perhaps a voodoo of some sort on the house. Elizabeth’s fortẻ appears to lie in the direction of culture. 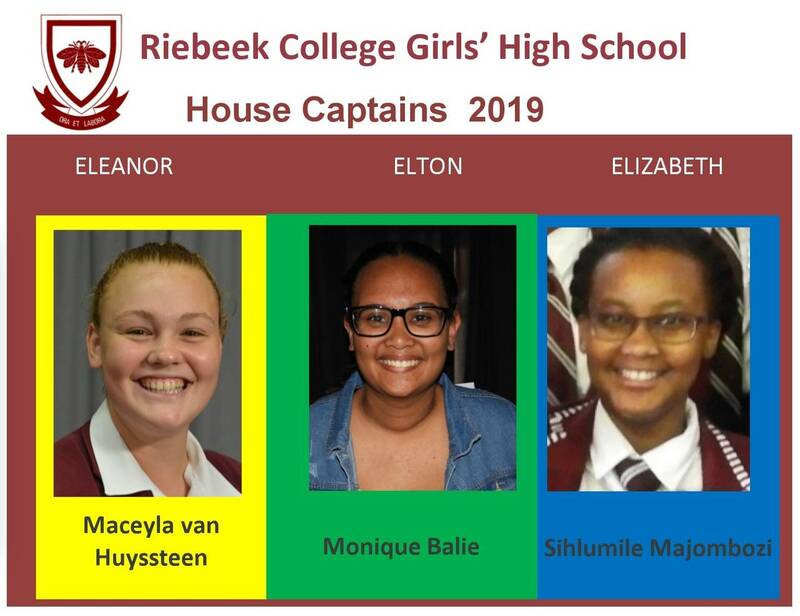 One significant change took place circa 1989 during the tenure, as headmistress, of Mrs Natalie Stear, who introduced a change in the way house members were selected. Previously, one was placed into a house at random, or according to what past or present relatives one had at Riebeek. Thenceforth all new boarders were to be placed in Elton, while the hostel’s existing “old pots” were able to choose whether to migrate or not. There was initially some fear that Elton would be unfairly advantaged, as it was perceived that boarders, restricted as they were from distracting townee activities, would perform better at sport and academia. 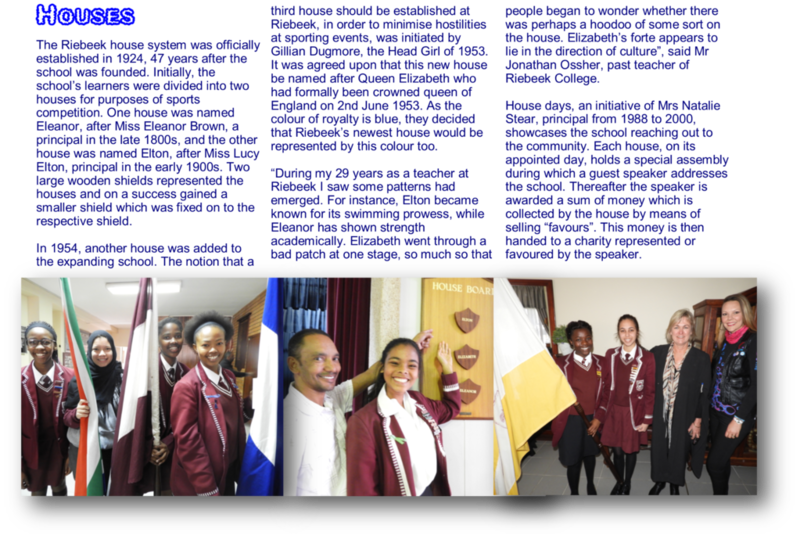 As it turned out, however, the number of boarders has since diminished considerably, and is no longer a significant factor in determining Elton’s placing in inter-house competitions. Another development that occurred in the Stear era was House Days. Each house, on its appointed day, would hold a special assembly during which a guest speaker addressed the School. Thereafter the speaker was awarded a sum of money which had been collected by the house by means of selling “favours” – usually some little knick-knack representing the house. This money would then be handed to a charity represented or favoured by the speaker. A pleasing touch is that Elizabeth’s House Day is often held on the Queen’s birthday. contributions). The other two-thirds consist of Old Girl matters! Another reason for the large number of blank spaces is that sports and other codes have not remained constant over the years. 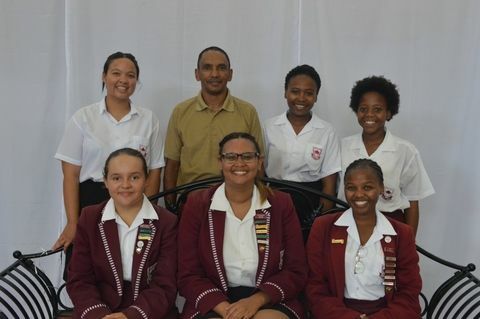 While some, such as indoor hockey and volleyball did not feature at Riebeek in the early years, others, such as lifesaving and squash have come and gone. What of the future? 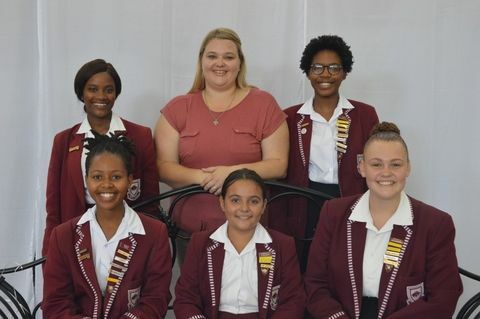 With the advent of Africanization of schools such as Riebeek, it remains to be seen whether the house system will be retained in its present form. While decentralization is not a foreign concept to Africa (for instance the division of Shaka’s armies into regiments, and the existence of royal “houses”) changes could well come about in the schoolhouse system. Modernization, too, is taking its toll on established institutions. The change will be slow, and irregular, depending on how individual schools manage the situation. In Riebeek’s case the problem lies in the abstractness of the houses – they are not visible entities, they exist in name only. Moreover, they do not have unique identifying symbols such as in the case of Muir College, where each of the four figures in its crest represents a house. In earlier years at Riebeek the houses made use of informal mascots and mottos, which are sadly lacking today. A few years ago an attempt was made to generate greater awareness by revealing the house each time an individual was singled out for praise for an achievement. Regrettably, the exercise was not sustained. There was also a move to introduce house anthems, one of which was actually sung by Eleanor at a swimming gala, but a general lack of interest put paid to such aspirations. It may be argued that learners’ horizons have broadened and that there is no place for institutions that they may see as antiquated. However, there is still a place for tradition in schools, and it would be most unfortunate if the present generation neglected to maintain a level of house consciousness, not just for old times’ sake, but also for new times’ sake.